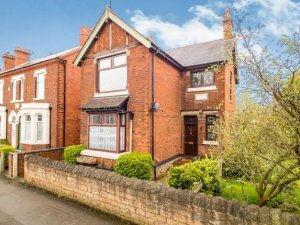 A well presented three bedroom detached home with a whole host of period features. This accommodation comprises of entrance hall, lounge, kitchen and separate dining room. To the first floor are three double bedrooms and bathroom. The front of the property is accessed through a gate and path leading to the property which an array of plants , trees and shrubs. To the the side is a generous size plot with garden laid to lawn and providing off road parking. To the rear is a patio area. Double glazed uPVC box bay window facing the front. Radiator and electric fire. Double glazed uPVC window facing the rear. Radiator, vinyl flooring. Wall and base units, butler style sink, integrated oven, gas hob, over hob extractor, space for washing machine, dryer, fridge/freezer. Single glazed wood window with stained glass facing the front. Radiator. Double glazed uPVC window with obscure glass facing the side. Heated towel rail, vinyl flooring. Low flush WC, panelled bath, shower over bath and electric shower, pedestal sink. To the the side is a generous size plot with garden laid to lawn and providing off road parking. To the rear is a patio area.